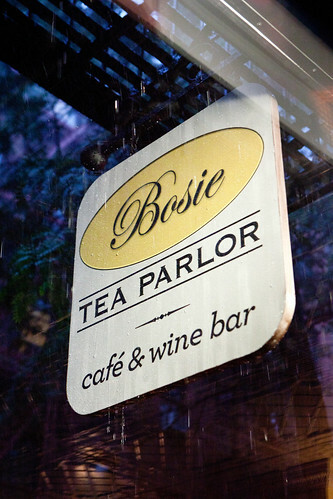 Bosie Tea Parlor is what I would consider a tea parlor/patisserie calm oasis from the busy, somewhat touristy area of Bleecker Street. This tea house is definitely a place for people like myself who appreciates excellent quality teas. 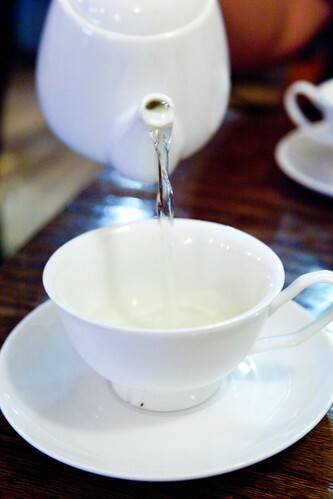 (Surely, I think most of you readers know about my perpetual love of expertly made and sourced coffee, but I am raised from a traditional Chinese family and inherently taken upon the tea culture as a child.) 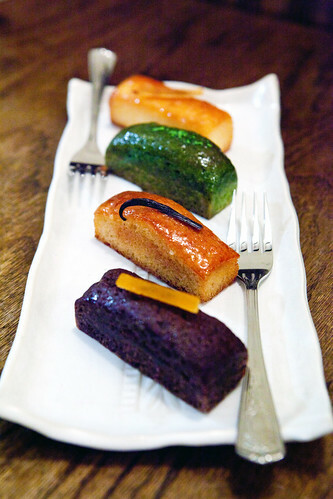 What makes this tea parlor extra special is their talented pastry chef, Damien Herrgott to make their food sublime. 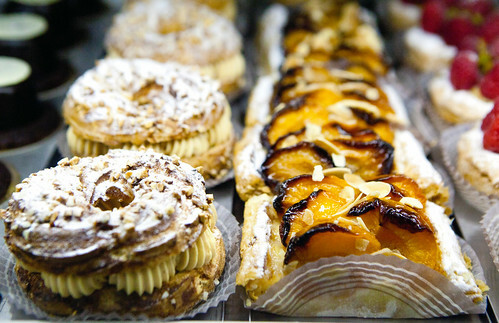 His pastries made me have a flashback of yesteryear when I was in Paris; being surrounded by beautiful and delicious pastries. The parlor feels cozy and welcoming with attentive service within this 22-seater. I made my visit during the torturous heatwave last Thursday evening (and have a downpour by the time we arrived) we had in New York City with a friend and pretty much tried the whole shebang. Want to know what we ate? Hold on to your seats, it’ll be a doozy. 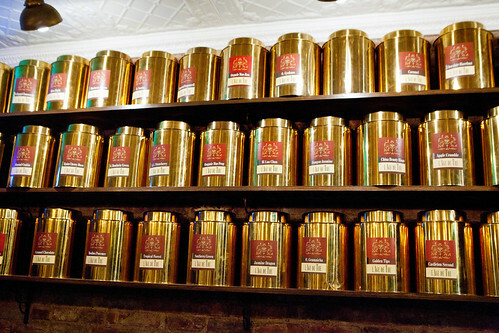 Amongst the first things you’ll see in this café is the shiny, golden tins of teas from L’Âge de Thé. With some assistance and expert guidance from Nicky, as well as sniffing some of the wonderful aromas of the teas, we ended up choosing a small pot of Golden Tips (a very rare white tea from the Guang Xi province that has a dark brown and golden colored tips, as seen above; $7) and Chocolate Hazelnut (blended black tea with prominent chocolate and hazelnut flavors; $4). I really was enamored with the Golden Tips for its earthy sweetness. The Chocolate Hazelnut tastes like a dark chocolate bar with hazelnuts except there’s almost no calories and you are drinking it. Both are very excellent grade teas and they are great on their own. We started with hot savory food and had a bowl of asparagus soup with with Honshimeji mushrooms, crumbled egg and Parmesan cheese ($9), served along with sliced baguette. The soup was sublime. 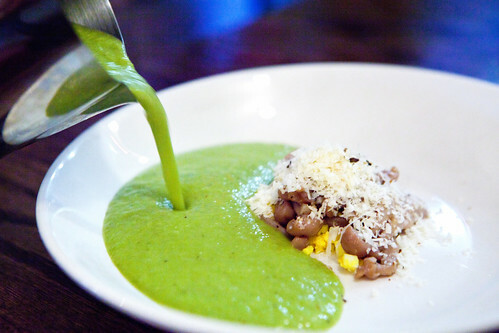 It’s elegantly rustic in form as the asparagus soup is not purely smooth, which I like about it, and it’s flavorful without being too salty and viscous. 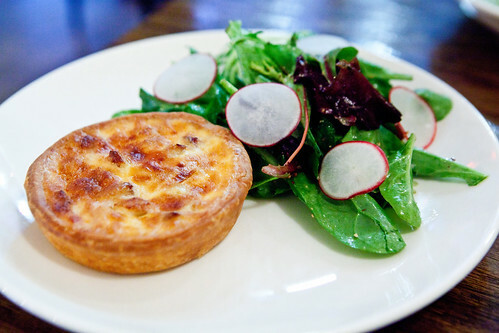 The other hot savory was the quiche Lorraine ($9), which we were told it’s arguably the best in town. This quiche was pretty damn good from the well made flaky crust and the large cubes of smoky bacon studded within the custard. 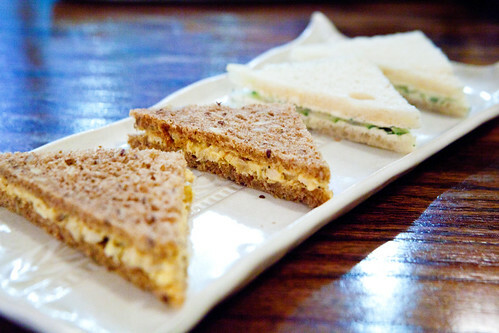 Moving on to slightly lighter fare with the savory, we had four different types of tea sandwiches (3 flavors for $9.50; salmon is +$1) Dill & Cucumber, Chicken with golden raisins & curried mayo, Smoked salmon with cream cheese and Farmer egg salad with thyme blossoms. All were done the traditional way of having thinly cut bread slices sans the crust and tightly sandwiched with its fillings. 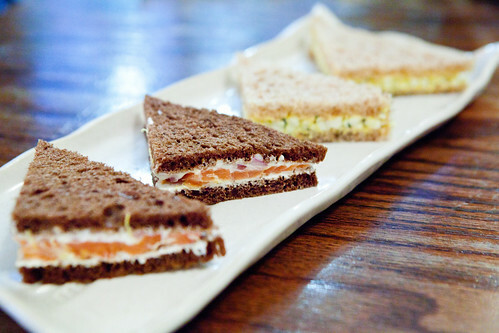 While all were very good, my two favorites were the smoked salmon and cream cheese (traditional but the pumpernickel bread worked made it extra good) and the chicken with golden raisins and curried mayonnaise had an interesting sweet-savory flavors that I enjoyed. 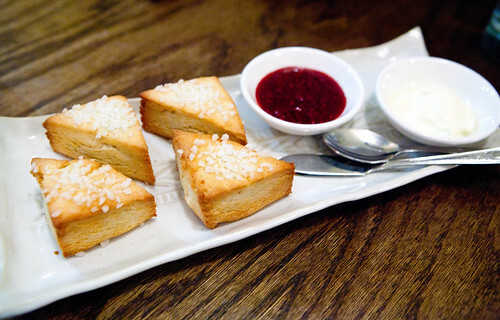 As we tread on to the sweeter territory, we started with plain scones served with clotted cream and homemade raspberry jam ($3.50 for 2 scones) and small tea cakes ($13 each for small loaves). The scones were topped with coarse pearl sugar; wonderfully crumbly and buttery with the crackly texture from the sugar crust. The tea cakes we had were Lemon, Matcha green tea, Vanilla, Dark chocolate topped with candied orange zest. All were moist, dense, finely crumbed, and not overtly sweet (which is highly desired for me with desserts). The ones I liked the most was the dark chocolate with candied orange zest (the flavors were intense and I like orange and chocolate together) and the matcha tea for its grassy bitterness. Then we’re bestowed with a plate of a dozen macarons. This was probably one of my highly anticipated things I wanted to eat here because of Chef Herrgott’s background working with Ladurée in Paris and Bouley Bakery in NYC. These macarons did not disappoint me. It’s one of my top five favorites in NYC. 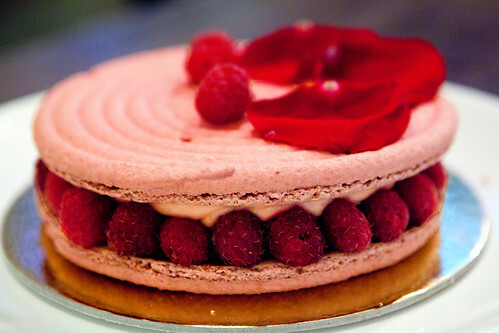 The macaron cookie has structure, having a crisp exterior like a meringue, while the filling was smooth and velvety. None were too sweet and they were robustly flavored. The flavors we had were the dark chocolate, vanilla, passion fruit and milk chocolate, lemon, pistachio, raspberry, matcha green tea, jasmine, rose, peanut butter and jelly, Darjeeling, and salted caramel. 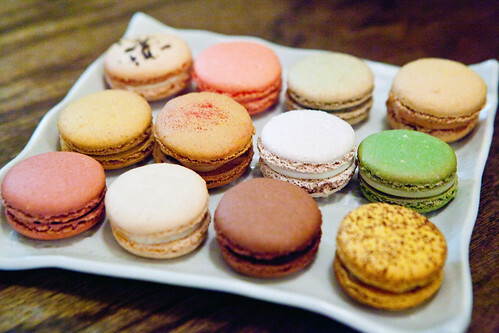 The first six listed are the time-honored macaron flavors, which are executed beautifully. Their recent debut of tea flavor variations (the last six listed) were excellent as well. 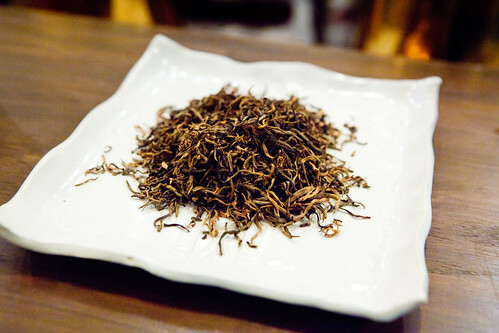 Darjeeling (photo of it bitten) was wonderfully flavored of Darjeeling – the tea’s muscat-like flavor with hints of spice has the tea’s characteristic astringency. The jasmine was pungently floral of this flower, while the rose was tamed much better. The salted caramel had great creamy, burnt caramel flavor and the salt gave it a nice twist. The peanut butter and jelly played on American nostalgia except they replaced grape with raspberry. 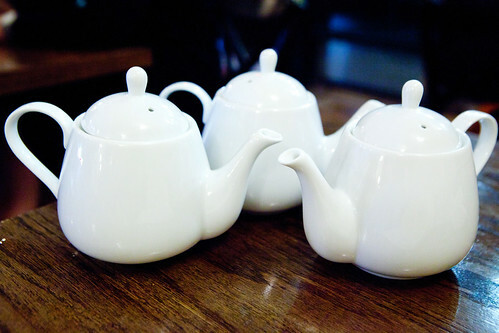 For the upcoming finale of pastries, we ordered another pot of tea – Tropical Forest ($4 for a small pot). 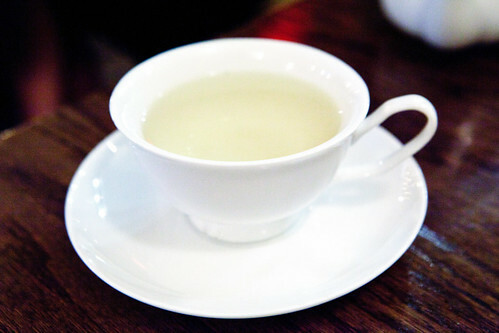 This light green tea was wonderfully aromatic of pineapple, mango and papaya. It’s naturally sweet and works with our upcoming pastries. Also, my dining companion loves everything tropical fruit flavored. For the very new, experimental pastries, as Chef Herrgott explained and presented to us were chamomile-strawberry eclair ($7) and chai pastry (they’re working on a name). 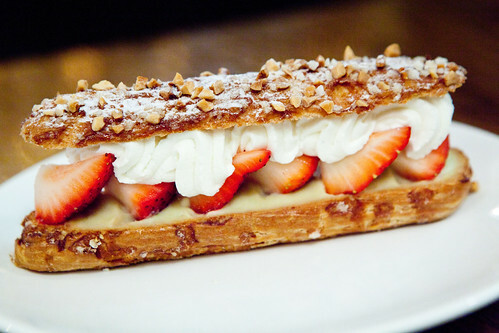 The stunning eclair was made of a hazelnut-studded pâte à choux, layered with chamomile pastry cream, quartered fresh strawberries and sweetened whipped cream. This was a delightful seasonal eclair. 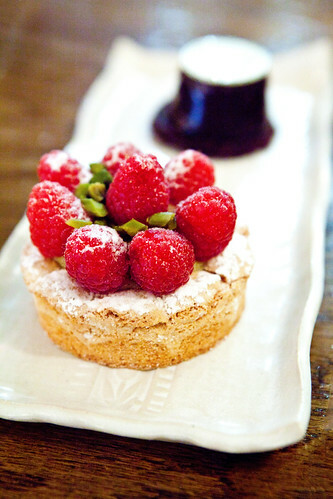 The choux was tender, the chamomile cream was lightly floral that it enhanced the ripe juicy strawberries. 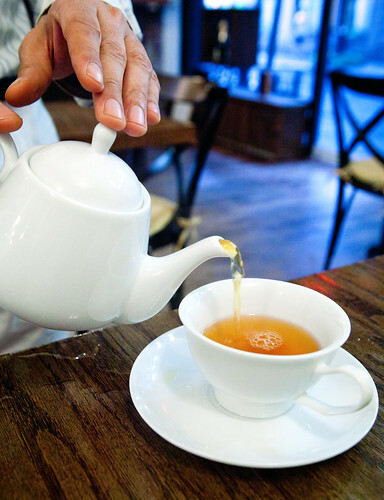 The chai pastry is definitely for people who adores this spicy tea. 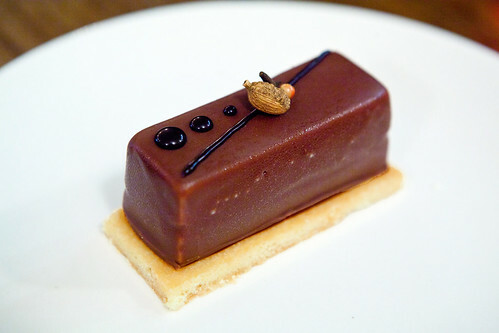 This particular pastry is made of chocolate chantilly enrobed with chai ganache, with a base of sablé Breton. The little spices on top are cardamom pod and clove. It’s heady with chai flavor with very good quality milk chocolate as its creamy, milky background. Moving on to their normal lineup of pastries, we went to the Darjeeling tart ($6) and Ispahan ($6.50). Both are exquisite pastries. 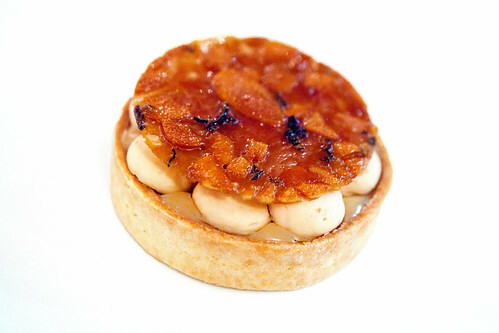 The tart made of pâte sucrée, Darjeeling chantilly, Darjeeling ganache, and praline cream complimented so well that my friend and I can’t have enough of it. 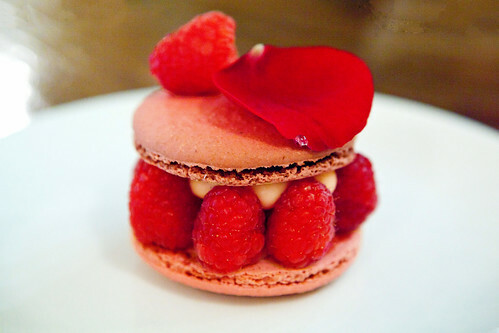 The Ispahan – composed of rose macarons, filled with cubed litchis, fresh raspberries and rose cream – gave me a vivid, spine-tingling flashback of my vacation to Paris last year when I ate Pierre Hermé’s (photo or my photo set of my obsession eating Hermé’s pastries found here). Yes, it’s that good. The Rasbperry Pistachio Montebello ($6.50) and Eclipse ($6) were well executed. The Eclipse is a dark chocolate sabayon, enrobed in crunchy caramel ganache topped with white chocolate and edible silver on a base of chocolate biscuit. The name is very apt for this dessert – dark chocolate that treads on to decadent with some crunchy textures to break up all things smooth and creamy. 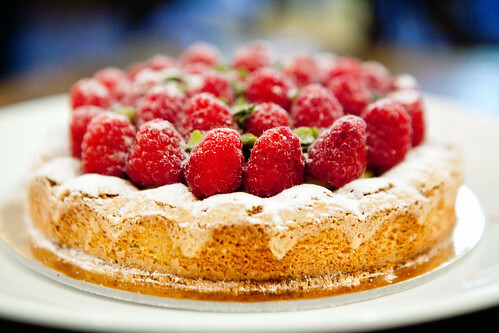 The raspberry montebello was gorgeous to look at (see its larger sibling toward the beginning of the post) and as delicious. 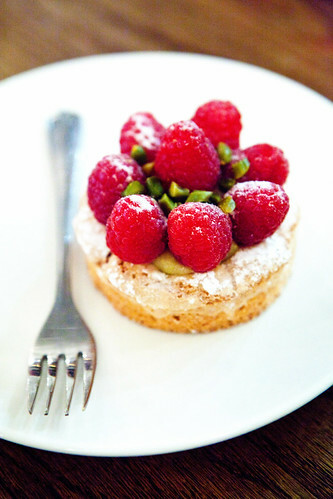 The pistachio cream found underneath the sweet-tart raspberries meld very well with the moist, soft pistachio dacquiose. Despite the fact we tried everything, we had to bought some pastries home since it’s too good not to share with other friends and family. 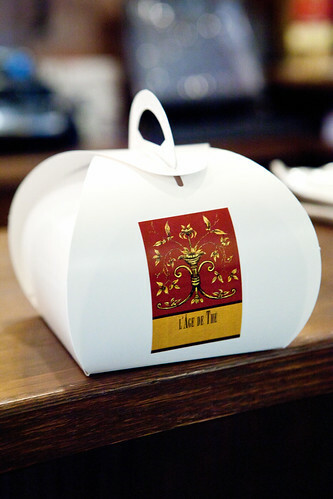 I adore their take-away boxes. Très chic. 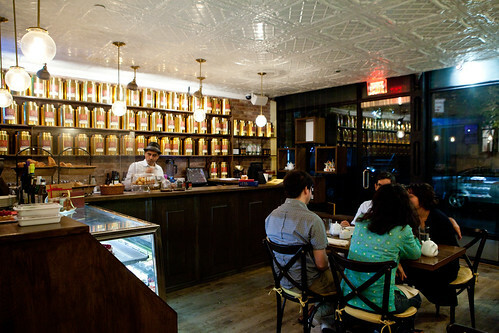 Overall, this is your go-to destination if you are looking for excellent teas, delightful French-style pastries and cookies (with very well made savory options that’s made to order), respite from the touristy area of Bleecker, and/or if you’re a Francophile and want a piece of Paris, Bosie is it. @Kim: It’s corrected; thanks for pointing that out. 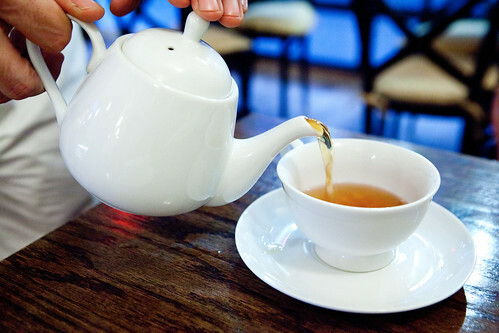 As for tea getting it’s spotlight now, yes, it’s pretty refreshing to see that happening. I have been searching for French pastry but forgot to go here! what a feast! Did they carry you out or did you only take tiny bites? Carol: Yes, it’s worth going to! These are normal sized pastries. Thankfully, I brought a friend along to eat all of this with me.